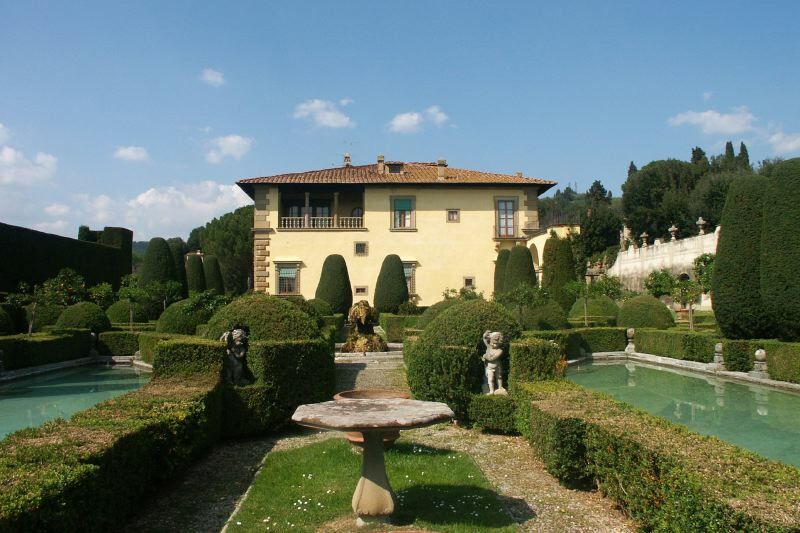 This is one of the most magical places in the florentine hills: the architecture of the villa and of the old garden are justly famous and in fact the garden has become one of the most famous in the world. The villa was finished in 1610 by Zanobi Lapi and during the succeeding centuries has belonged to the Marquis Capponi, Princess Ghykha, sister of the queen of Serbia and other well-known noble families. It lies on the hills above Florence, just outside the village of Settignano, with a beautiful view of the countryside and of the city of Florence, which can be reached in ten minutes by car or by the convenient public transport that passes through the village. The furnishings consist of perfectly restored antique furniture, decorated with elegant tapestries and old paintings. During your stay 2 domestics are employed every day for the cleaning of the villa. The bed and bath-linen is changed twice a week. The garden is an architectural masterpiece, and contains all of the best-loved features of the classic old italian garden and has been described in enthusiastic terms by all of the famous guests who have stayed at Villa Gamberaia in the last century. In part of the grounds close to the villa a swimming-pool has been built for the guests` private use, where complete privacy can be enjoyed. On the edges of the grounds are some elegant independent apartments that may be rented together with the villa or separately. Together with the rental of the property you can also book a cooking service, with menu to be agreed on the premises, which includes breakfast and dinner. The villa has air-conditioning included in the price. GROUND FLOOR: large entrance hall with vaulted ceilings, an internal loggia, 4 double bedrooms with bathroom with bathtub and shower attachment, 3 large reception rooms with living-room areas, one of which has direct access to the garden. FIRST FLOOR: large living-room with access to a large covered terrace overlooking the garden, used also for dining outside, large dining-room, large kitchen with larder and dishwasher, wardrobe/ironing-room with washing-machine, 4 double bedrooms sharing 2 bathrooms with bathtub with shower attachment, 1 double bedroom with bathroom with bathtub and shower attachment. The villa has a lift. Some of the bedrooms can be changed into twin bedrooms. The private swimming-pool lies near the Neptune`s ornamental grotto. Other services included in the price: Included in the price is a staff of 1 people for daily cleaning for 8 hours a day, 6 days a week.